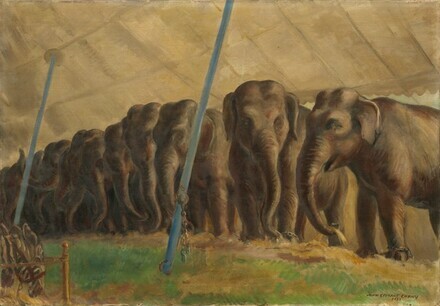 Robert Torchia, “John Steuart Curry/Circus Elephants/1932,” American Paintings, 1900–1945, NGA Online Editions, https://purl.org/nga/collection/artobject/55844 (accessed April 25, 2019). Lloyd Goodrich, "Exhibitions in New York," Arts 15 (May 1929): 325. The exhibition featured representations of the circus by William Glackens, Yasuo Kuniyoshi, John Sloan, Reynolds and Gifford Beal, and Guy Pene du Bois, and the Whitney Studio Club was decorated to look like a circus for the occasion. Bret Waller, "An Interview with Mrs. John Steuart Curry," in John Steuart Curry: A Retrospective Exhibition of His Work Held in the Kansas State Capitol, Topeka (Lawrence, KS, 1970), 13. Elephants look easy to draw but they really are not. It is hard to get the feeling of balance and movement as well as their bulk. If you will notice elephants are always moving and swaying back and forth on their feet. . . . How should you go about drawing an elephant? Begin with the large circular shapes first: a big round egg for the body, and remember that it should be tilted up in front, for you will observe that an elephant is higher at the shoulder than the hips. Then continue with the cylindrical shapes of the legs, head, and trunk. Draw them loosely so you can get the action of the animal at once. You then can make a more careful outline of the body over these forms and even suggest shading as you go. Radio interview of May 13, 1938, quoted in Laurence E. Schmeckebier, John Steuart Curry's Pageant of America (New York, 1943), 210–211. “Speaking of Pictures . . . These Tell the Story of John Steuart Curry of Kansas,” Life, Nov. 29, 1943, 19. Circus Elephants represents 12 elephants standing in a line under a tent eating hay. Their massive forms diminish as they diagonally recede into the background, interrupted only by two tent stays that lean toward them and divide the space. Just as Curry described, the various positions of the elephants' trunks give the scene a sense of gentle undulation. The artist captured the figures and expressions of the two elephants on the right very effectively, with the result that they have a greater sense of individual personality than their companions and seem to converse with one another. The small head of the zebra in the left foreground accentuates the elephants' enormous bulk. Irma B. Jaffe, "Religious Content in the Painting of John Steuart Curry," Winterthur Portfolio 22 (Spring 1987): 33, 36–38. See Sylvan Cole Jr., The Lithographs of John Steuart Curry: A Catalogue Raisonné (New York, 1976), no. 28. The lithograph is also listed in Joseph S. Czestochowski, ed., John Steuart Curry and Grant Wood: A Portrait of Rural America (Cedar Rapids, IA, 1981), 102, 123, no. C 29. Edward Alden Jewell, “Allied Artists of America,” New York Times, Apr. 3, 1933; “John Curry’s Art Shown at Gallery,” New York Times, Mar. 25, 1947. One notable exception to the criticisms of Curry’s Ferargil circus show was Lewis Mumford, who wrote, “I cannot help thinking that the circus has a hypnotic effect on him that focuses his powers better than any other subject he has explored.” See Robert Wojtowicz, ed., Mumford on Modern Art in the 1930s (Berkeley, CA, 2007), 147. (Walker Gallery, New York); purchased by Mrs. Grace Hendrick Eustis [later Mrs. Neill Phillips, d. 1966], New York, by 1939; her second husband, Admiral Neill Phillips, Upperville, Virginia; gift 1976 to NGA. According to Peyton Boswell Jr., Modern American Painting, New York, 1939: 205. An Exhibition of Paintings of the Circus by John Steuart Curry, Ferargil Galleries, 1933, no. 3, as Elephants. Loan Exhibition of Drawings and Paintings by John Steuart Curry, The Lakeside Press Galleries, Chicago, 1939, no. 35, as Elephants. John Steuart Curry, 20 Years of His Art, Associated American Artists, New York, 1947, no. 12. Center Ring: The Artist: Two Centuries of Circus Art, Milwaukee Art Museum; Columbus Museum of Art, Ohio; New York State Museum, Albany; Corcoran Gallery of Art, Washington, D.C., 1981-1982, no. 31. Persistance of Regionalism: John Steuart Curry and Grant Wood, Cedar Rapids Art Center; Edwin A. Ulrich Museum, Wichita State Univesity; University of Missouri Museum, 1981, no. 31, repro. John Steuart Curry: Inventing the Middle West, Elvehjem Museum of Art, University of Wisconsin-Madison; M. H. de Young Memorial Museum, San Francisco; The Nelson-Atkins Museum of Art, Kansas City, 1998-1999, pl. 24, fig. 8. Images from the World Between: The Circus in Twentieth-Century American Art, Wadsworth Atheneum Museum of Art, Hartford; The John and Mable Ringling Museum of Art, Sarasota; Austin Museum of Art, 2001-2002, fig. 116. Circus! Art and Science Under the Big Top, Bruce Museum of Arts and Science, Greenwich, Connecticut, 2010-2011, no catalogue. The priming covers all of the tacking margins, indicating that the canvas was primed before painting and that the priming was commercially prepared rather than applied by the artist. The first layer of paint anticipated the location of the tent poles, which suggests that the composition had been finalized before the artist began working. To complete the painting the artist added details using thicker touches of paint applied with a nearly dry brush. The paint of the tent roof at the center right is thick, but medium-rich rather than dry. Fluorescence under ultraviolet light of the white paint in this area is yellow, suggesting it may be zinc white. The painting is in very good condition with only a few tiny holes along the top and bottom edges, where it appears that a framing element might have been attached with tacks to the front of the painting. Some grime and bumps of a waxy material along the bottom have accumulated on the unvarnished surface. Luce, Henry R., John Shaw Billings, and Daniel Longwell, eds. "Curry of Kansas." Life 1, no. 1 (23 November 1936): 28-31, color repro. Boswell, Peyton. Modern American Painting. New York, 1940: 62, 138, color repro. Schmeckebier, Laurence. John Steuart Curry's Pageant of America. New York, 1943: 207, 210-211, fig. 237. American Paintings: An Illustrated Catalogue. National Gallery of Art, Washington, 1980: 141, repro. Czestochowski, Joseph S. John Steuart Curry and Grant Wood: A Portrait of Rural America. Columbia, MO, 1981: 56, 125, fig. 31. Williams, William James. A Heritage of American Paintings from the National Gallery of Art. New York, 1981: 227, repro. 229. Jaffe, Irma B. "Religious Content in the Painting of John Steuart Curry." Winterthur Portfolio 22, no. 1 (Spring 1987): 33, 36-38, fig. 16. American Paintings: An Illustrated Catalogue. National Gallery of Art, Washington, 1992: 155, repro. Kirshon, John W., and Tom Anderson, eds. Chronicle of America. London and New York, 1995: 656, repro. Junker, Patricia A. John Steuart Curry: Inventing the Middle West. Exh. cat. Elvehjem Museum of Art, University of Wisconsin-Madison, WI; Fine Arts Museums of San Francisco, CA; Nelson-Atkins Museum of Art, Kansas City, MO, 1998-1999. New York, 1998:15, 125, pl. 24, fig. 8. Gustafson, Donna. Images from the World Between: The Circus in Twentieth-Century Art. Exh. cat. Wadsworth Atheneum Museum of Art, Hartford, CT; John and Mable Ringling Museum of Art, Sarasota, FL. ; Austin Museum of Art, Cambridge, MA, 2001-2002. London, 2001: no. 31, pl. 116. Ringling Bros. World's Greatest Shows merged with Barnum & Bailey Greatest Show on Earth in 1919, forming the Ringling Bros. and Barnum & Bailey Circus. For a summary of the events of the 1932 season, called the "worst of the depression era," see George L. Chindahl, A History of the Circus in America (Caldwell, ID, 1959), 161–162. It is not known if Curry had any personal contact with John Ringling, the last surviving of the seven original Ringling brothers, who was a noted art collector and founder of the John and Mable Ringling Museum of Art, Sarasota, Florida. “Kansan at the Circus,” Time, Apr. 10, 1933, 42, reported that John Ringling had given Curry “the run of his ‘Greatest Show on Earth’ for a month.” For a general discussion of Curry’s 1932 spring tour with the circus and its aftermath see Patricia A. Junker, “John Steuart Curry and the Pathos of Modern Life: Paintings of the Outcast and the Dispossessed,” in John Steuart Curry: Inventing the Middle West (Madison, WI, 1998), 152–164. Other important circus subjects that Curry completed in 1932 were The Great Wallendas (private collection), Baby Ruth (Brigham Young University Museum of Art), The Aerialists, The Reiffenach Sisters, Agony of the Clowns, and The Runway (Swarthmore College Art Collection, PA). Thomas Craven, "John Steuart Curry," Scribner's 103 (Jan. 1938): 40, quoted in M. Sue Kendall, Rethinking Regionalism: John Steuart Curry and the Kansas Mural Controversy (Washington, DC, 1986), 33. Laurence E. Schmeckebier, John Steuart Curry's Pageant of America (New York, 1943), 207. Earl Chapin May, The Circus from Rome to Ringling (New York, 1930), 94. For a summary of these incidents, see M. Sue Kendall, Rethinking Regionalism: John Steuart Curry and the Kansas Mural Controversy (Washington, DC, 1986), 126–127. The former is illustrated in Laurence E. Schmeckebier, John Steuart Curry's Pageant of America (New York, 1943), fig. 239, and the latter in American Watercolors, Drawings, Paintings and Sculpture of the 19th and 20th Centuries, auction catalog, Christie's, New York, Mar. 15, 1985, lot 283. Patricia Junker, “John Steuart Curry and the Pathos of Modern Life,” in Patricia Junker et al., John Steuart Curry: Inventing the Middle West (Madison, WI, 1998), 162. The priming covers all of the tacking margins, indicating that the canvas was primed before painting and that the priming was commercially prepared rather than applied by the artist.